If you are searching for “No Money Down Hard Money Lenders”, “Zero Down Hard Money Lenders” or “Hard Money Loan For Down Payment” in Phoenix or Scottsdale, Arizona, Brad Loans by eMortgage can help! Our team is professional, friendly, and passionate about doing everything we can to get Phoenix Valley residents and investors the funds for the real estate they need. If you need money for a home or real estate investment opportunity in the Phoenix Valley and want to get started with the loan application apply for a hard money loan from Brad Loans today! Fill out our hard money loan application online or give us a call at 602-999-9499 to find out if you qualify! Our Application Form is Quick, Secure, and Easy! Common search phrases used to find our $0 down hard money loan services include: No money down hard money loans, private money lenders 100 financing, hard money lenders with no money down, hard money down payment assistance, hard money lenders no money down, fix and flip loans no money down and hard money loans 100 financing. We offer 100% Loan To Value Loans W/ No Down Payment Using Cross Collateral! Hard money loans with no money down or no down payment are available by using cross collateral. What is cross collateral? Cross collateral is where you (the hard money loan borrower) uses collateral as a form of security to the hard money loan provider. For example, lets say you want to purchase a property for $100,000. Usually you would have to make a down payment of 30% (Investor) or as low as 20% (Owner Occupied). For this scenario lets say you don’t have the money for the down payment or you want to use the money for renovations etc. Instead of a down payment, you can use equity as cross collateral. Having equity (property, money, collateral) is the only way to avoid paying a down payment on your hard money loan. For example: If you own another property that is worth $80,000 free and clear, you actually have $80,000 worth of equity. In this case Brad Loans would be able to loan you up to 100% of the property purchase price with no down payment and no money down. Brad simply uses the property that you already own (your positive equity) and the property you are buying as collateral. You are basically putting your equity up as security for the loan provider instead of putting down a cash payment. Any Additional Fees For Using Equity Instead Of A Down Payment? Brad loans charges an additional fee of $975 for hard money loan borrowers who choose to put up equity instead of providing a cash down payment. What if I have bad credit, will you need a down payment then? 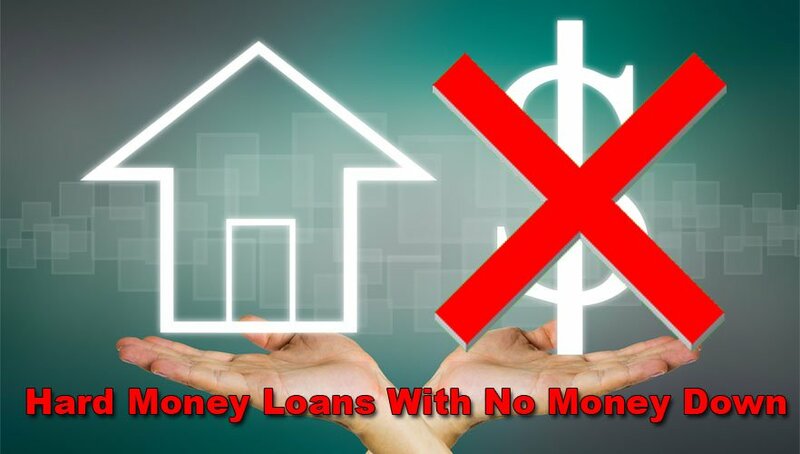 No, as long as the borrower can provide sufficient collateral to cover the full value of the loan, you can still get a hard money loan with no money down. Would you like to see if you can qualify for a hard money loans with no cash down? Have you had foreclosures in the past? Are you not a US citizen yet? Discharged bankruptcy? Short Sale? Have Bad Credit? No problem!! Brad Loans by eMortgage is a bad credit or no credit hard money mortgage lender. How To Qualify For A Hard Money Loan W/ No Down Payment? We have two hard money loan programs, one for investors and one for owner-occupants. There are different features and requirements for each type of loan. Read more below to understand how you can quality for your hard money loan with no down payment. Proof of income showing that less than 45% of your income before taxes will be used towards your Brad Loans payment, car payments, credit card or student loan payments. Statements from your bank showing that you have the funds available for loan fees, down payment, third party closing costs etc. Also, a copy of 401(k) or IRA statements. 30 days worth of paystubs, 2 years worth of tax returns, and W2’s/1099’s, or 2 years worth of bank statements as a replacement for the tax returns. Must have a 45% or less debt to income ratio. How long does it take before I get my hard money loan funded? 7-10 day funding from the date of the original application. Regardless of credit issues you will most likely qualify for a Brad Loan if you can prove adequate income and have the down payment! How long does it take before I get my hard money loan funded? 3-5 day funding from the date of the original application. What Is A Hard Money Loan? A hard money loan is an asset-based financing option that allows the borrower to receive funding secured by the equity in a home or building you own. Private investors are usually who issues hard money loans. Read more about What Is A Hard Money Loan? What Is A Hard Money Loan For Real Estate or Fix & Flip? A hard money loan for real estate is a loan program that allows you to acquire a hard money loan by using your paid off home or building as equity. This allows real estate investors to get the money they need quickly without having to use traditional bank loans which are almost impossible to get with bad credit. Hard Money Real estate loans are also known as bridge loans, fix and flip loans, owner occupied loans, construction loans and more. What Are Points On A Hard Money Loan? Points on a hard money loan are a percentage of the total loan amount that you have to pay in addition to your original loan. 1 point = 1% of the loan. Points are used to simplify closing costs without separation underwriting and application fees etc. How To Get A Hard Money Loan? Do Hard Money Loans Show Up On Credit? No, hard money loans usually don’t show up on your credit report. However, if you default on your loan and your home is in foreclosure proceedings with the lender, that can show up on your credit report because it is in public records. How Does A Hard Money Loan Work? All hard money loans usually require a payment to cover fees. For example, at Brad Loans by eMortage all loans require $1,920 in fees to cover loan processing, underwriting, application fee, documentation preparation and lender inspection. You can get hard money loans with $0 money down if borrower has an additional property that is free and clear or the property has significant positive equity (Cross Collateralized Loan). After you agree to the payback terms, your loan will be granted and you will receive funding. You can make monthly payments or pay your loan in full. Some lenders will charge a pre-payment penalty. However, Brad Loans by eMortgage offers hard money loans with no pre-payment penalties. Review: “Brad Loans is the way to go. Easy – FAST and Friendly. I have taken 2 home loans out with Brad and both experiences were wonderful. Thank you Brad and Amber!” Desert Wide Properties. To see if you quality for a hard money loan with no down payment in Phoenix or Scottsdale, call 602-999-9499 or fill out our 5 minute, simple ONLINE LOAN APPLICATION to get approved for a Brad Loan today. Hard money lending is the best way to get the money you need for purchasing real estate without the harsh requirements of banks or their snail’s pace loan process. If you are searching for “No Money Down Hard Money Lenders”, "Zero Down Hard Money Lenders" or "Hard Money Loan For Down Payment" in Phoenix or Scottsdale, Arizona, Brad Loans by eMortgage can help!